I've been working on putting this outfit together for my hunter for about a month now. It's taken a while to gather up all the pieces. As I mentioned previously, I really, really like kilts in-game, and I thought it would be an unusual look for a hunter. Aqualaeta is definitely a Night Elf through and through, so I wanted something that matched the green and purple night elf colors. I also wanted fairly low-profile and streamlined, as "natural" looking as possible. I've had gigantic shoulders forever and ever but I thought with something less conspicuous, she could have more of a ranger look. So here it is; these aren't really the best screenshots but I'll try to get better ones soon. Please enjoy the Little Fawn, one of my favorite vanity pets. 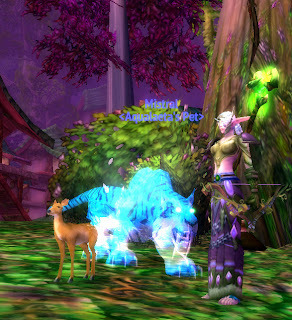 I also took a shot at an action shot to show off the bow, although it was really hard to catch it since I wanted a wooded background and most of the mobs in Hyjal die in 1-2 shots. But there's a sprite darter! Here are the items involved. This outfit started with the legs and the bow and went from there. I love this bow because it looks so foresty and perfect for a nelf hunter. Bow: Honorable Longbow -- I can't say enough about this bow. It's got wood, it's got vines, it's got leaves. It's not overly flashy but it has just enough detail to be really attractive. This shares a model and colors with the Dutiful Longbow (both of them being BoE greens) as well as the Wyrmstalker's Bow. The last is a quest reward from Icecrown that I sadly vendored before I knew transmog was coming. I really love this outfit and it makes me super happy to have finally gotten the kilt today and been able to finish it out and actually do the mog. The only things I'd really like to change are the color of the chest (wish it were a little bit greener), the enchant glow (turn it off! ee! ), and the color of the shoes. I know there are other versions of the shoes in different colors but the blue seemed like the best option out of what was available.